David Porter was an officer in the United States Navy in the rank of captain and the honorary title of commodore. Porter commanded a number of U.S. naval ships, including the famous USS Constitution. 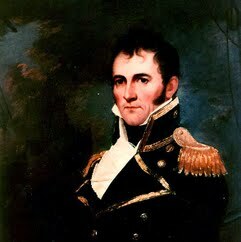 He saw service in the War of 1812, the Second Barbary War of 1815 and in the West Indies. On July 2, 1812, Porter hoisted the banner "Free trade and sailors' rights" as captain of the USS Essex. The phrase resonated with many Americans and became a standard summary of U.S. war aims in 1812. Porter was later court martialed; he resigned and then joined and became commander-in-chief of the Mexican Navy.